An end to a perfect day at the Santa Monica beaches. I am writing this on the plane leaving LA after a relaxing and enjoyable 4 days stay. Our host, my uncle Jack, was the ideal host and gave us the royal treatment. 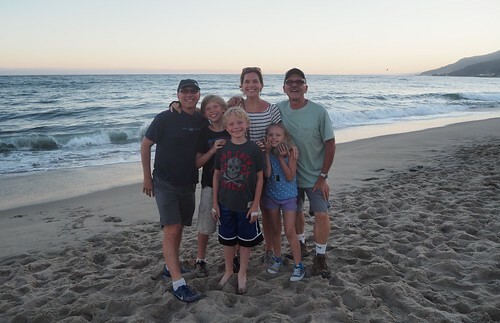 He showed us the best of LA and we had a worry-free visit. Thank you! 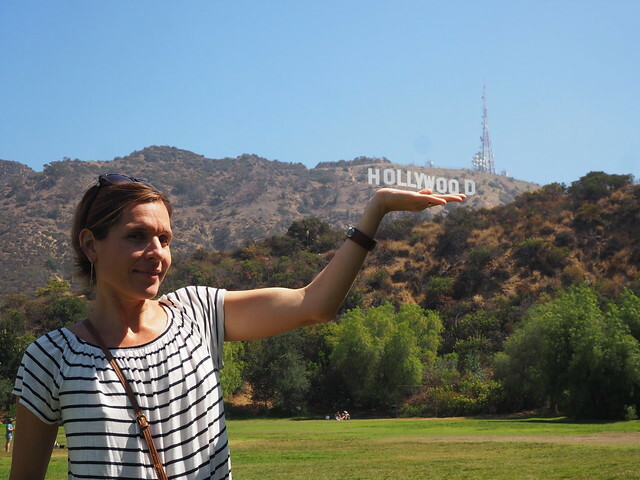 We spent the morning playing in a park at the Hollywood sign. Getting to know new places is one of my favorite things to do, more so when I can do it with my family. Los Angeles is one of the great world cities and LA and California are distinctive parts of American culture and could easily be a country of its own. I think we saw a lot and did many of the southern California activities, from swimming in Santa Monica to hiking in Griffith Park, to cruising through Beverly Hills, to give our family a good understanding of the city. • Southern California is the desert. They are also in the midst of a multi-year drought and residents have been asked to reduce their water use by 25%. I read a lot about the aqueducts that bring water to the city. Most of California’s water however, is used for agriculture and there are no reductions in that use yet. California is one of the most prolific fruit, nut and vegetable growing areas in the world, due much in part irrigation schemes. They will have to come up with ways to use water more efficiently. We felt the drought more outside the city and our hike through the Hollywood hills was quite dusty. • There are a lot of free spirits and “riffraff” in LA. We saw many characters and scruffy, unkempt people. After being in Japan, it was a bit shocking to see the individuality and diversity of people. • As in most cities throughout the world, if you are wealthy they are great, but if you are middle class, it is better to live in a smaller city or town in my opinion. The real estate prices were super high. Beverly Hills reminded me of our neighborhood of Dedenje in Belgrade. As soon as we crossed the line, ivy covered walls and tall palm trees gave it a peaceful look. 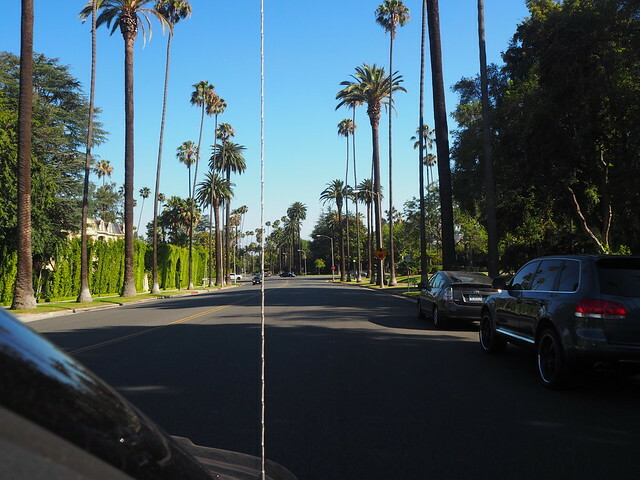 There were many really large homes and Rodeo Drive is the main shopping district for the them. There is a lot of money in LA, but it is obviously not distributed evenly and I feel sorry for the underclass and lower middle class trying to make ends meet. We stayed in the suburb of Studio City, which is upper middle class and really didn’t see any of the poorer areas. 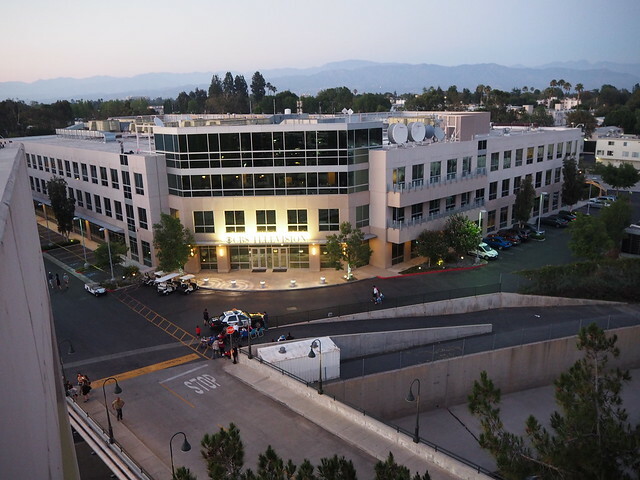 • Sitting on top parking lot of CBS Studios, listening to the Beach Boys and watching the fire works was a very California experience. The many billboards advertising new television shows was another sign that the main industry of LA is television and movies. LA has been a driving force of spreading American culture over the world. We didn’t run into any actors or celebrities. • We went to two beaches (Ventura and Santa Monica) and both times the water was cold. The currents off California come down from Alaska and the water does not warm up until August. • The Mediterranean climate is the best overall weather. The bright sunny days with that extraordinary light, the cool nights, and mild, rainy winters are nice to live in. The winters are fresh and not too cold and the summer days are hot but not humid. Los Angelinos were complaining about the humidity our first couple of days there, but we didn’t feel it coming from humid Japan. I lived in Perth, Australia for two years with the same climate and loved it. The hills, pines and yellow sands and rocks reminded me of Spain and Cyprus. It is my ideal climate to live in. 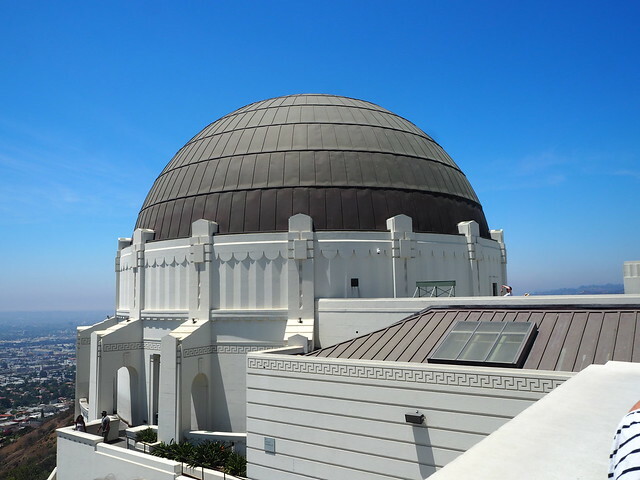 The main dome of the beautifully designed Griffith Observatory. • The Griffith Observatory is definitely worth visiting! We attended the planetarium show and it was truly inspiring. It made me want to study astronomy and to look up at the night sky. I really do love science and hope I can pass my passion to my children. There were many exhibits in the museum and despite the crowds, it was informative and one could have a good experience. I would like to go back again. 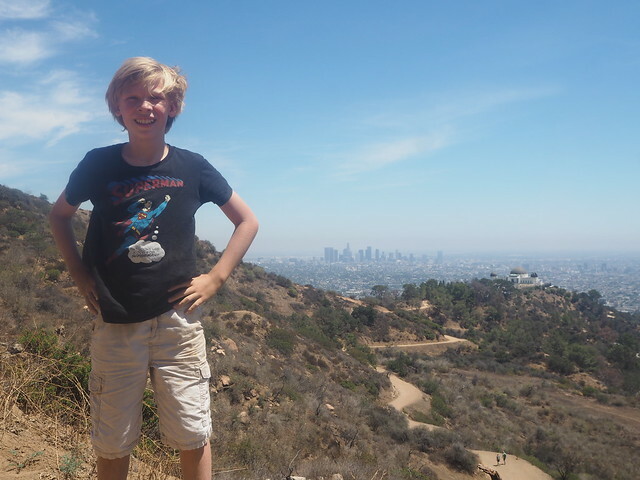 Owen above the Griffith Observatory with LA in the background. • I didn’t know that Scientology started in Hollywood. We drove by the world headquarters. 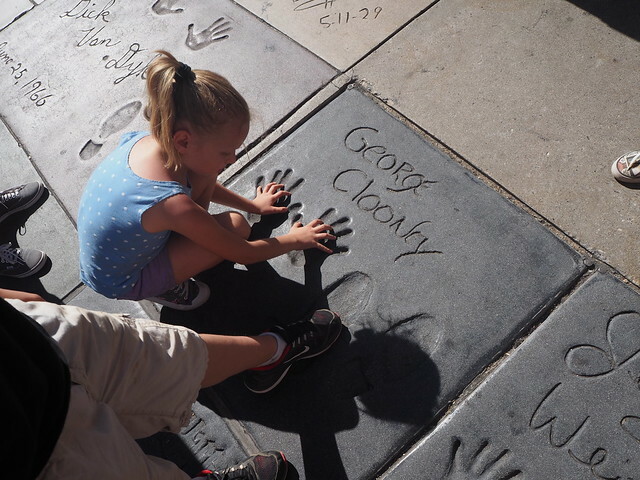 • Nadia was excited to see the hand and foot prints of the movie stars at the Chinese Theatre. We went to the epicenter of movies, Hollywood Boulevard. It had the feel of Times Square with the crowds of people. The area was a bit seedy with bars, hustlers and other assorted characters. • In experiencing the crazy amount of traffic and large highways, it gave me a feeling of sadness. To have so much time wasted and everyone in their own little isolated capsule, wanting to be somewhere else while stuck in line…Although Los Angeles has its pleasures and attractions, unless I was loaded with money, there are better places to live. The stark contrast between rich and poor is disturbing to see. I do want to come back and visit again. I really want to see some other parts of the state like Death Valley, Palm Springs, Yosemite, and small town northern California.